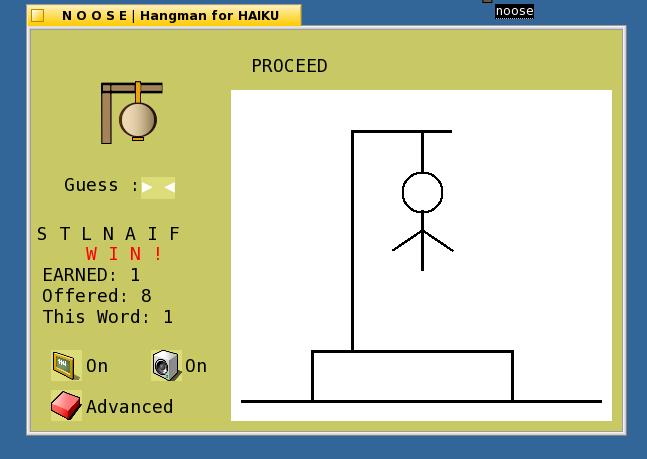 Hangman for HAIKU Noose is an english only hangman game. The program file can be installed anywhere on your system as long as the words file, and the img-snd folder remains in the same directory as the program file. One may add or modify the words file. Each word is one line. Words may contain letters a through z and may contain an apostrophe ( ' ). no other characters are allowed. There are four levels of play based on the difficulty of each word. New words added to the words file are evaluated for difficulty as they are added. Click the level button to change levels. If the scoreboard is on, each word can earn points up to the length of the word plus one. For each wrong guess, the value of a win is diminished by one point, but cannot go below one point. A win gets at least one point, a loose gets none. Clicking the Scoreboard button changes the setting. Offered points are the total points that one could earn with no misses. Turning the scoreboard off then on again resets the earned and offered points. Clicking the Speaker button changes the setting.